Extended by popular demand, Skinnable Shadows is now on view through July 7, 2018. 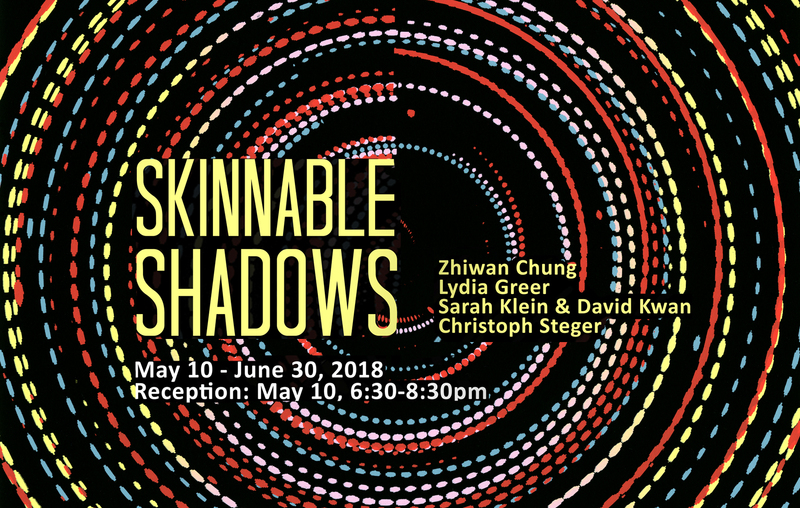 Kala Gallery is proud to present Skinnable Shadows, featuring new work by 2017-2018 Kala Media Arts Fellowship artists. The exhibition includes works by Zhiwan Cheung, Lydia Greer, Sarah Klein/David Kwan, and Christoph Steger. Kala Media Arts Fellowships are awarded to a group of innovative artists working in and across video, sound, performance cinema, and installation. 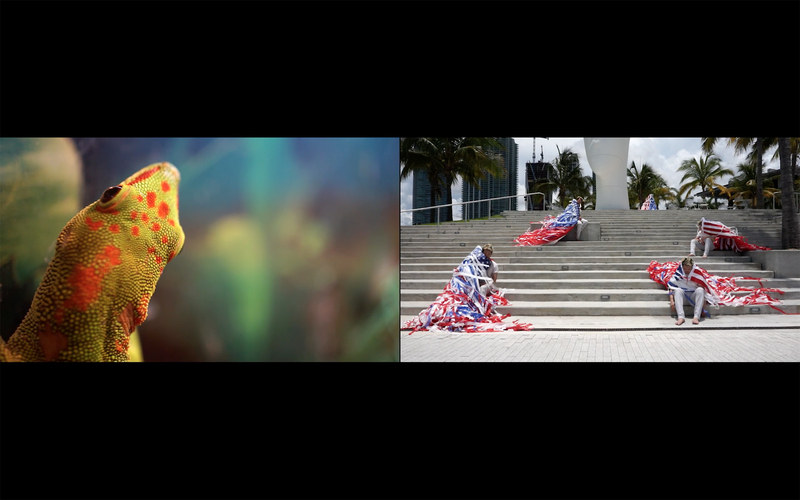 These artists piloted this new program, a creative residency at Kala to create multi-media projects that culminate in Kala gallery public programming. Skinnable Shadows is generously supported with audiovisual equipment from Meyer Sound. 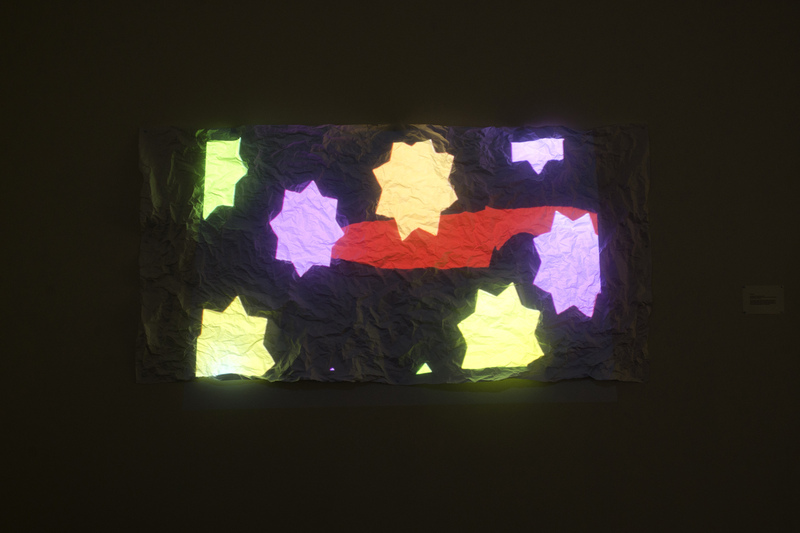 Referring to changeable interfaces of computer software technology, the exhibition Skinnable Shadows explores how technology influences interactions with socio-politics, self-identity, and sensory systems, interwoven in contemporary society. As cultural memes quietly self-replicate, mutate, spread out and create global networks of diverse cultures especially through new technology, we become accustomed to different types of experiences, customs and appearances. These layers of culture cover our body like countless skins and cast multiple shadows behind us unifying and struggling with our existing old-selves. 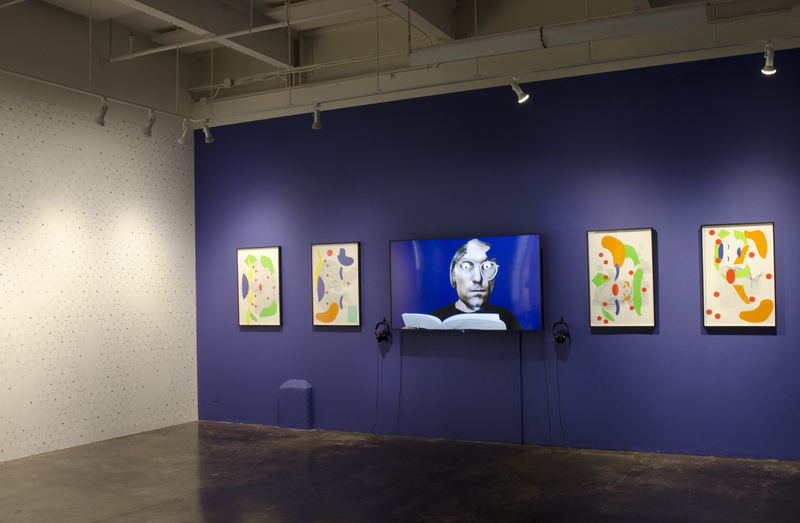 Artists in the exhibition examine how technology becomes a tool to create politically charged geography; how the Internet transmits intersections of truth and myth; how we experience sensations; and how we define our selves in physical and imaginary circumstances. 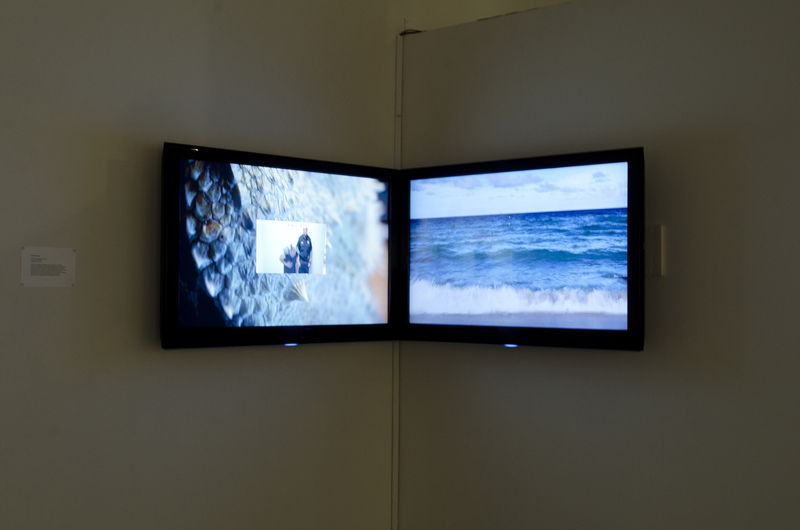 Welcome to Jungle Florida, Zhiwan Chung’s dual-screen installation examines “Florida Man,” an Internet meme linking articles and news stories about unusual crimes happening in Florida. Intersecting truth and myths widely spread online, Welcome to Jungle Florida asks questions surrounding human agency in connection to race, identity and the environment. Reflecting his own background growing up in the US as a Chinese immigrant, Zhiwan’s work focuses on naming of spaces between identities, displacement and struggling with an impossible homecoming. 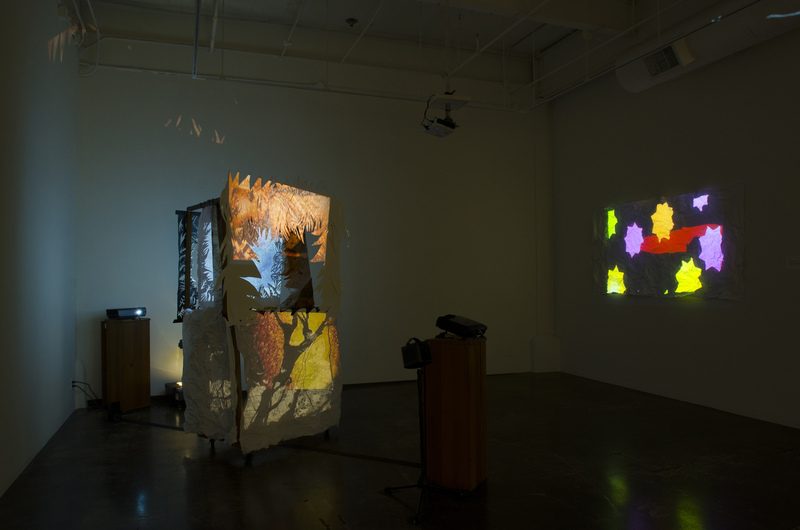 Lydia Greer presents her Gesamtkunstwerk #1: Hallucinations, a media installation with sound, shadow puppet animation, and light projection. Lydia’s Hallucinations is inspired by the life of Mirabai, a legendary 16th century poet and street performer in Rajasthan, India. Featuring Mirabai Songs composed by John Harbison and Mirabai’s poetry, Hallucinations tells Mirabai’s story of escaping societal violence against women, her survival, freedom, joy and ultimate transformation. Lydia will also present her live performance with musicians William Sauerland (countertenor) and Shauna Fallihee (soprano) as well as puppeteer Caryl Kientz on Saturday, June 9 at the Kala Gallery. During their Media Residency at Kala, Sarah Klein and David Kwan, a collaborative duo worked on an immersive installation piece Among Points, Along Lines. 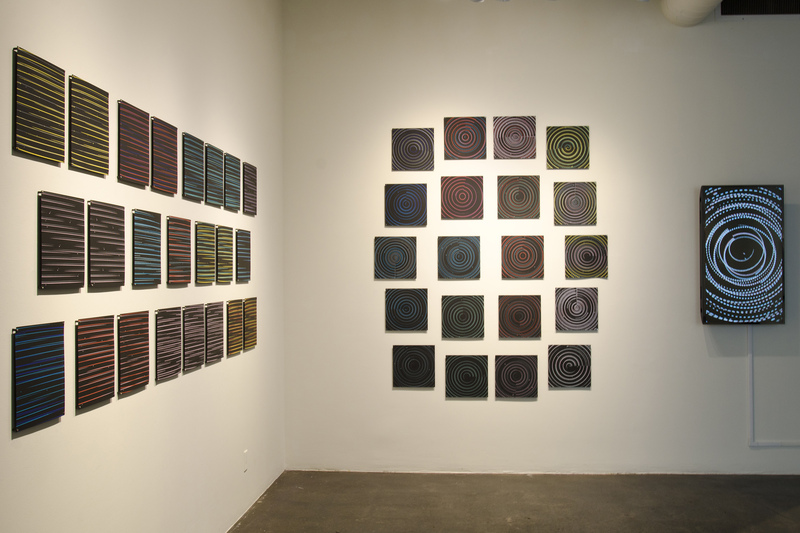 Starting with a base of visual patterns derived from sound visualizations on a video synthesizer, Sarah and David generated various transformative strategies from the monoprinting process. 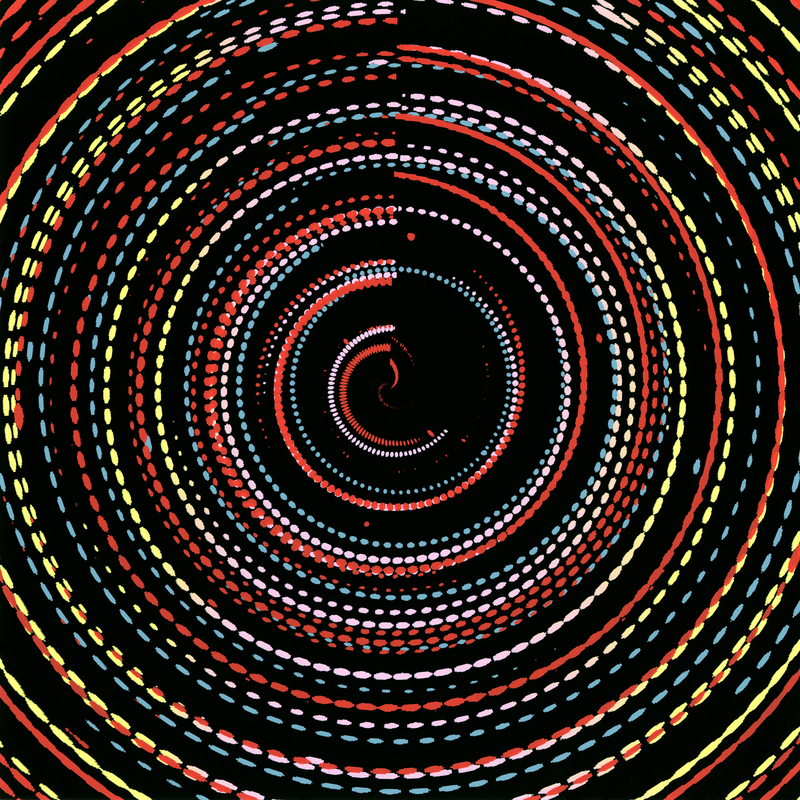 Through coloring and layering, they build a vocabulary of set forms and variations, and put them back as moving image animations. 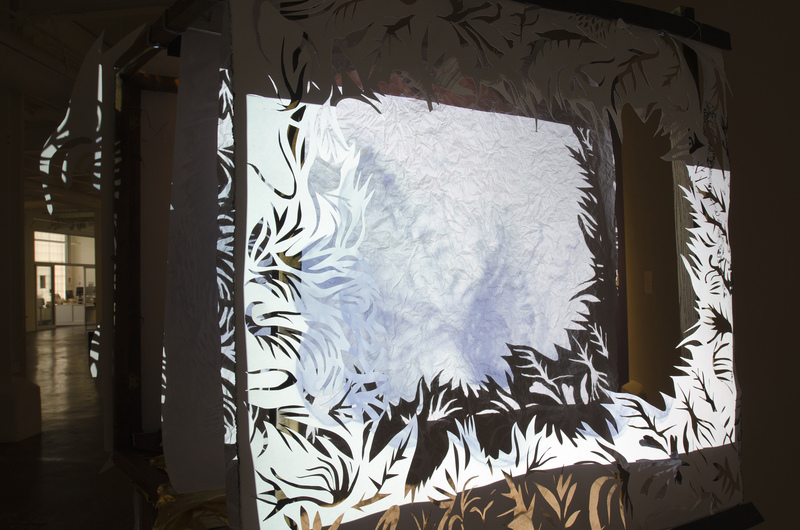 In the exhibition their installation creates a sensory space where audiences experience their prints, animation and sound individually, in combination or entirely, in a contemplative way. Christoph Steger’s installation Senseless Arabesques playfully investigates contemporary facial animation technologies in the context of biometrics, historical and cultural methods of measuring the human body and topographic mapping. His work questions the power structures of mapping and how politically geography is constructed. 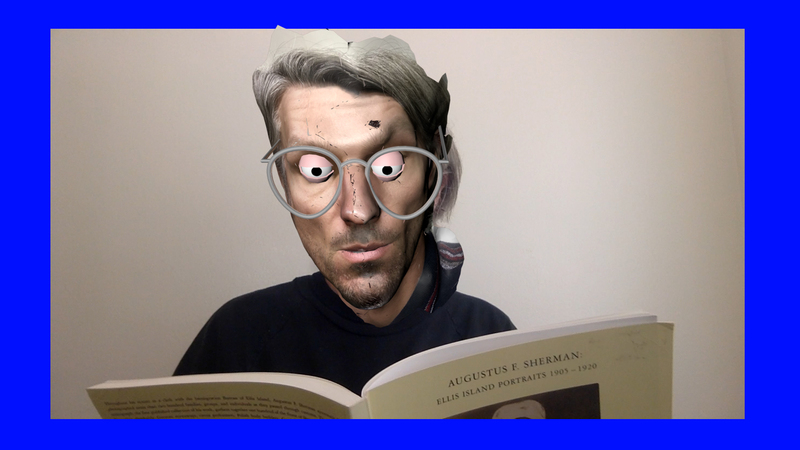 In his video, Christoph uses combinations of current 3D mapping and photogrammetry tools to (re)animate his own face. Digital prints explore notions of graphic projections that translate spatial data into flattened maps, intersecting digital UV maps, geographic information systems, acupuncture meridians and taxidermy. Christoph’s work ultimately highlights how people’s faces have become politically charged topographies. 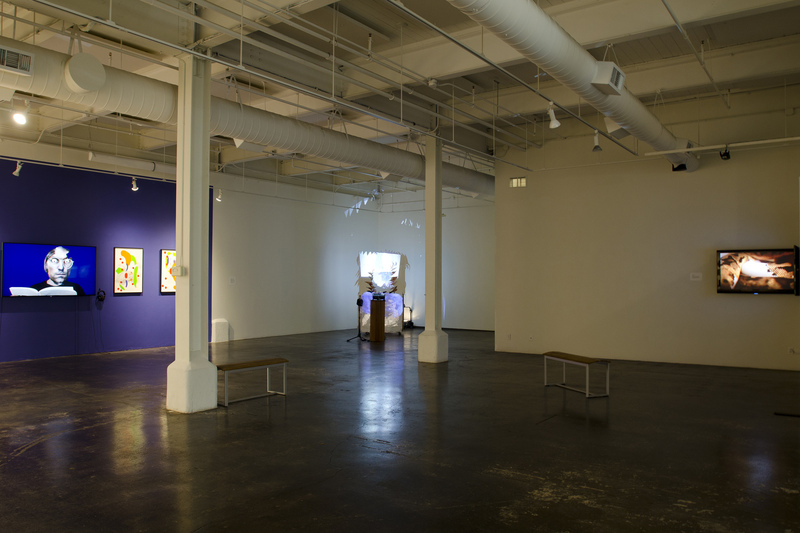 Tours of the Kala studio, gallery and print-and-media study center are also available by appointment. 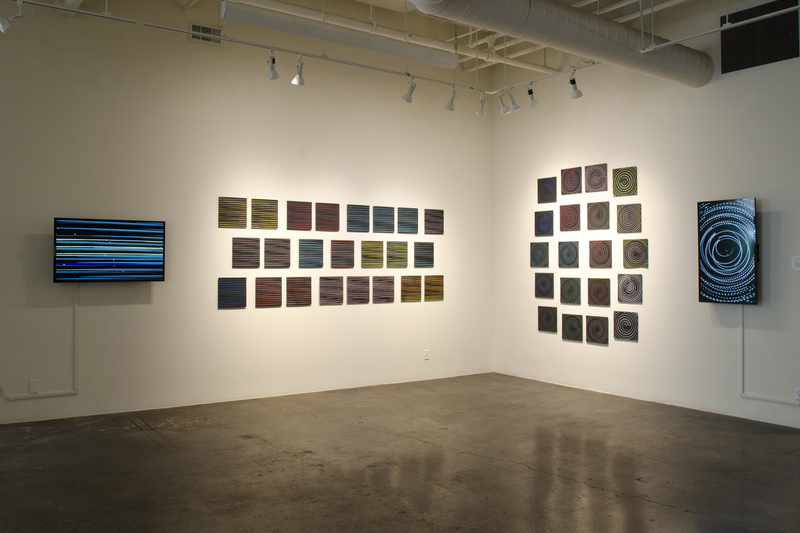 For more information, contact Mayumi Hamanaka, Gallery Director, mayumi@kala.org or (510) 841-7000 ex 201.